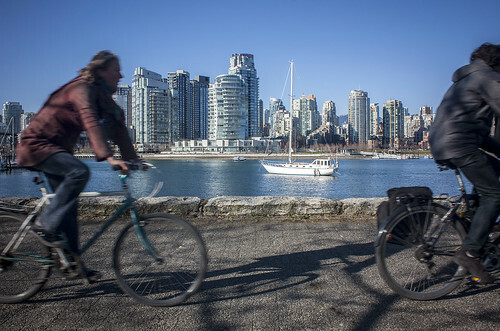 Walking the length of Vancouver’s Seawall is a lesson in design fads and fashions. 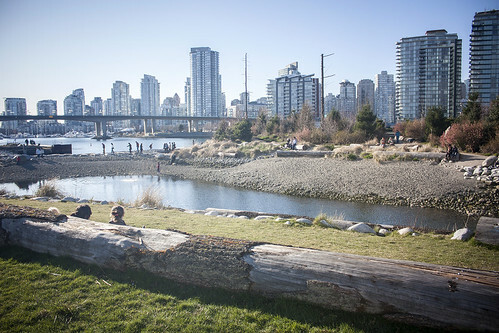 The Stanley Park stretch dates back to 1914 and is elegant in its simplicity; a rough-hewn stone wall threads its way around the park’s craggy shoreline, rainforest on one side and cool Pacific waters on the other. Near Granville Island, the path takes on a late-70s look with brick paving, timber planters and suburban landscaping, a trend that continued into the 1990s, with some variations — square-cut timber gave way to painted steel tubes as the material of choice for benches and railings, and the pine trees of the 70s were usurped by a 90s love of palms, which matched the SoCal architecture that was fashionable at the time. It’s that depth of experience that sets the newest part of the Seawall apart from its predecessors. It is not simply a space meant for enjoying the view; it’s a space that encourages active participation. 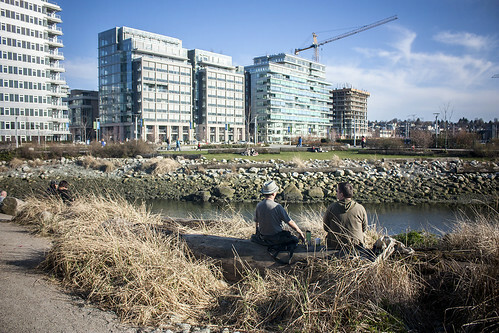 There are lounge chairs, a seemingly unregulated community garden and — most interesting of all — there’s Habitat Island. This spit of scrubby offshore land is accessible only at low tide via a pebble beach. The last time I visited, on a sunny spring day, the island was filled with people: teenagers rummaging through the bush, some people smoking pot, others drinking beer, families examining the aquatic life of tidal pools. It’s a lovely, unmanicured island, its wildness made all the more striking by the wall of glassy condominium towers across the water. 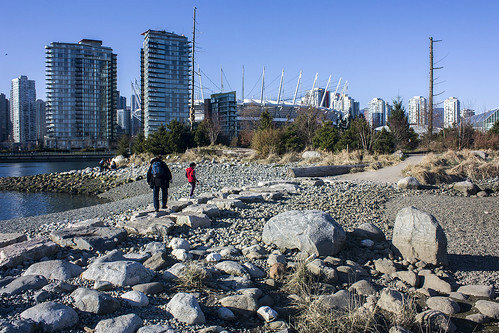 Yet Habitat Island is an entirely man-made space, created by dumping 60,000 cubic metres of rock, gravel and sand into False Creek. A deep layer of soil was spread over the site and 200 local varieties of trees, flowers, shrubs and grasses were planted. It has since become a refuge for birds, crabs and fish. 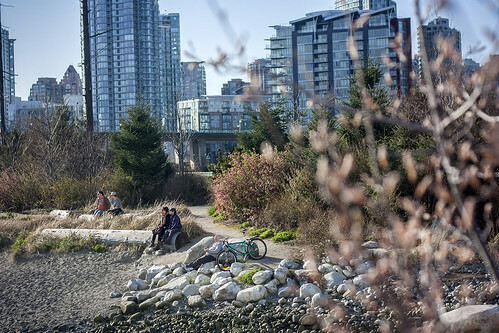 “When visiting the island, remember that is an urban oasis that we would like to keep in its natural state,” the Vancouver Board of Parks advises on its website. 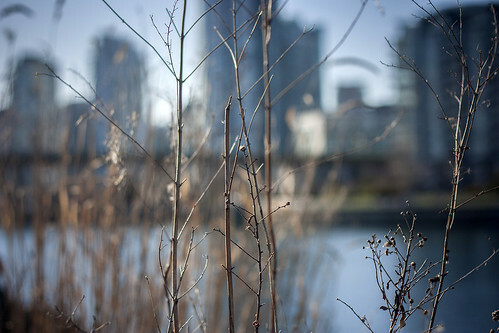 It makes me think of my conversation with architect Joel Sanders, who described the naturalism of Frederick Law Olmstead and his contemporaries as being driven by a “guilty conscience” over the impact of humans on the environment. Anyone with a healthy sense of irony will note that, with Habitat Island, things have come full circle: “Please don’t disturb the nature of this artificially-created environment.” At the same time, there’s a fluidity in the relationship between the built and natural you don’t see around Beach Avenue, for instance. The Seawall is pretty much complete, but if there was room to expand, I wonder what the trend would be in 20 years. 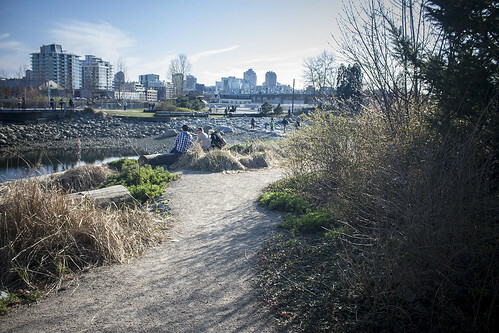 This entry was written by Christopher DeWolf , posted on Thursday March 28 2013at 04:03 am , filed under Art and Design, Canada, Environment, Public Space and tagged Exploring the City, False Creek, Parks, Seawall, Street Furniture, Streetlife, Urban Design, Vancouver . Bookmark the permalink . Post a comment below or leave a trackback: Trackback URL.